Historically, the expansion of ‘cello technique’ came later than on the violin. For the first hundred years of its history, the cello was considered to be primarily an instrument which provided the bass line. As was often the case in musical history, the expansion of cello technique was driven principally by a succession of virtuoso cellists performing their own compositions. These players, most notably Luigi Boccherini (1743-1805), toured throughout Europe raising the profile of the cello and in the process inspired other cellists and composers to push at the boundaries of previously accepted cello techniques. Haydn’s two cello concertos from the same period were inspired by and composed for particular performers in his orchestra. Whereas Paganini and Liszt revolutionized technique on the violin and the piano in the first half of the nineteenth century, the cello was still perceived as not being suitable for such treatment. In old age, after hearing a performance of the Dvorak cello concerto, Brahms is said to have remarked that had he known a cello could be used in such a way, that he himself would have written a cello concerto. In fact, driven by great teacher performers such as Klengel, Popper, Sebastian Lee, and Goltermann to name but four, the foundations for a further development of cello technique had been laid, and there was to be a great flowering of wonderful soloists at the beginning of the twentieth century. With the benefit of early recordings, we can listen to artists such as Casals, Feuermann, and Piatigorsky who were products of different cello schools, and were clearly virtuosos of the highest quality. From the mid nineteenth century, teachers composed ‘technical concertos’ to prepare the cello technique of their students for the larger challenges ahead. A corpus of etudes also emerged at this time which presented huge challenges to existing cello technique. This process continued throughout the twentieth century. Most students will know of the studies and exercises by Louis Feuillard, the teacher of Paul Tortelier. Books of various levels of difficulty which cover cello technique will initially be given to the student by their teacher. The more discerning students will tend to experiment using this material, and will discuss some of the issues and challenges which are raised with their fellow students or with their teachers when taking part in masterclasses. Students should also be prepared access further information in their conservatoire and university libraries, which will have suitable reference books and sheet music-etude/caprices. What constitutes a good cello technique? Technique is the ability to be able to interpret a given piece without any compromises because of technical inefficiency. 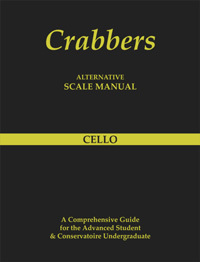 The basis of a good cello technique is rooted in scales, and it is to be hoped that use of the Crabbers scale manual will be a major factor in helping all who use it to attain a fine cello technique.